Two films, fiction and documentary, from and about Niki De Saint Phalle, the painter of theatre, sculptor, filmmaker and creative person. A fantasy about a woman’s attempts to exorcise the influence of her sexually domineering father. 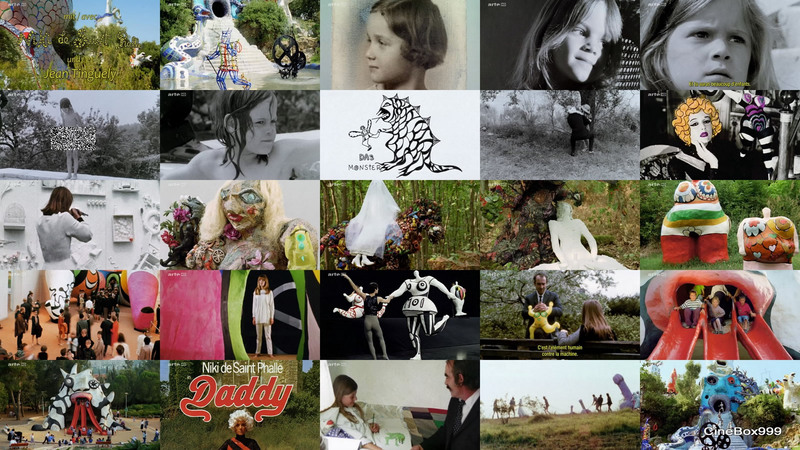 Peter Whitehead and Niki de Saint Phalle's 1973 film Daddy (UK) was an angry retort to oppressive regimes, particularly that most destructive one of childhood sexual abuse. But its power lies equally in its ambivalence and, in the end, its profound negativity. While Whitehead and de Saint Phalle resolutely sought to free representations of women from the triad of narcissism, masochism, and passivity, insisting that the feminine is home to the full range of aggressive and sexual drives, they also stripped away even the most facile hopes for a better world. In this, Whitehead and de Saint Phalle joined other creative radicals of the 1960s and 1970s (such as poets like Sylvia Plath and Anne Sexton, who wrote eloquently about both female resistance and resignation in the face of paternal sexual abuse) in presenting a pessimistic account of late modernity. In the section entitled "The Monster," Daddy sexually abuses the Daughter during a game of Blind Man. The daughter's response is ambivalent: she wants to scream; she promises to "lead [Daddy] to many countries" and to "conquer the world" for him; she commands "Down on your knees Daddy, say please say please ... Dirty dirty Daddy." The Daughter's abuse is symptomatic of the Daddy's cruelty generally: Daddy also beats and rapes the Mother. When the Daughter dons her Mother's wig, Daddy punishes her by locking her in a dark cupboard. Director: Niki De Saint Phalle, Peter Whitehead. Cast: Rainer Diez, Mia Martin, Clarice Mary, Niki De Saint Phalle, Marcel Lefranc, Jean-Pierre Raymond, Sere Inhof. Niki de Saint Phalle: Wer ist das Monster - du oder ich? 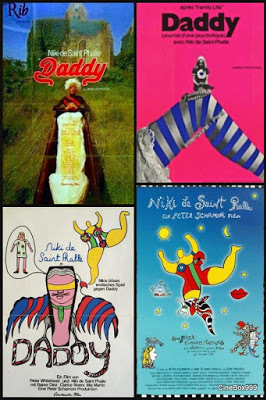 / Résumé de Niki de Saint Phalle : Qui est le monstre, toi ou moi ? / Niki de Saint Phalle: Who Is the Monster, You or Me? 1996. EN. In the sixties the painter and sculptor Niki de Saint Phalle started her career with shooting paintings, reliefs that were fired at with paint bags. She became famous and popular for her Nanas, colorful sculptures of big and cheerful women, and for the cooperation with Jean Tinguely. The frame of this film is a tour through her tarot garden in Tuscany. FR. S'appuyant sur les souvenirs de Niki de Saint Phalle et des images d'archives très swinging sixties, une plongée en couleurs dans l'univers de l'artiste. «Je cherchais qui était la femme...» Marie-Agnès Fal de Saint Phalle, surnommée Niki par sa mère, n'a cessé d'explorer ses démons, se réjouissant dès ses débuts d'ulcérer son aristocratique famille et de dénoncer un père incestueux dans un film déjanté, Daddy. Des premiers tableaux au fusil aux «Nanas» qui l'ont rendue célèbre, dont «la plus grande putain de la planète» (29 mètres de long, 6 de hauteur et 9 de largeur) créée pour le musée d'art moderne de Stockholm. Csat: Niki De Saint Phalle, Jean Tinguely. Download Daddy. 1973. And Bonus.